For the wee ones in your life. Personalized art as unique and special as they are. Designing an enriching space for a child to thrive in is something to keep in mind when decorating your baby nursery. There are so many wonderful baby nursery ideas out there. 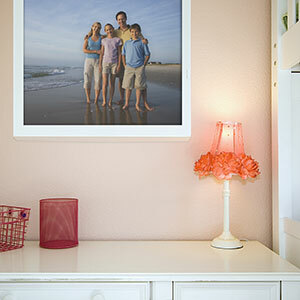 Adorning those walls with charming kids art is the perfect place to start. We love the idea of adding art with an educational twist to your baby room décor. Turning letters or numbers into unique canvas prints or framed art prints is such a fun idea! Spell out a name, create some number art, incorporate all of the ABCs, or make a monogrammed print. Have some gorgeous family photos that have been sitting on your hard drive? Give them the attention they deserve and get them up on those walls! Family photography, maternity photography, or newborn photography are all great ideas for baby room decor. Kids love animals. Art with a natural theme would fit perfectly as decor in any child’s room. Print images of flowers, trees, landscapes, or their favorite animals. It’s the kind of wall art that will open up anyone’s imagination. We adore illustrated, animated, or cartoon art. It helps to add a fun and playful touch to any room, but would be the cutest addition to any nursery decor. Add illustrated art with a lot of vibrant colors to really make it stand out. inspirational quote art by using our online text to photo tool. Incorporating meaningful quotes or sayings into your baby room decor can help to inspire and create a positive atmosphere. Choose words from your favorite book, song, or person -- or invent something yourself. Use our text to photo tool to get started on your very own quote art. 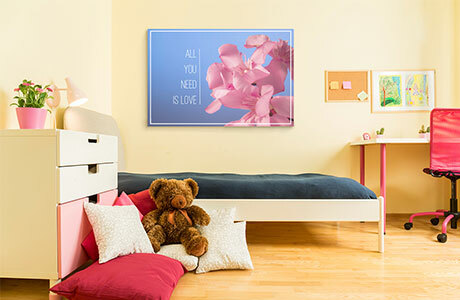 Bring your kids room walls to life!